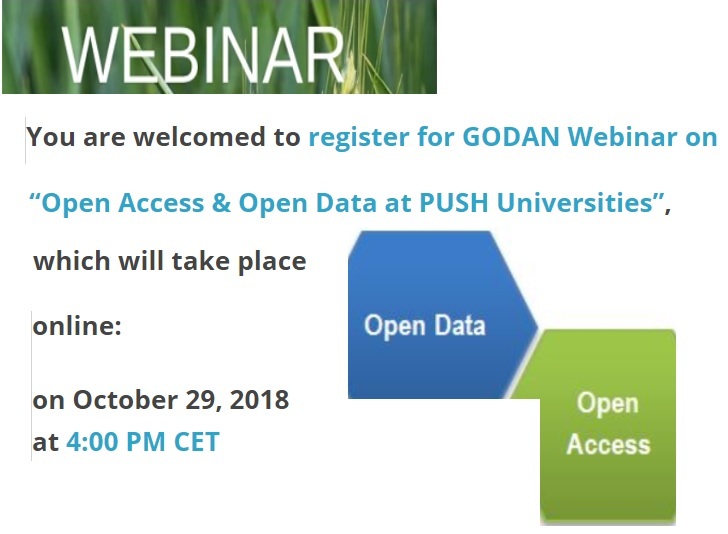 The webinar will introduce PUSH and will summarize the findings from an exploratory study of 99 PUSH universities in developing, using, and promoting open access and open data policies and practices. This report identified issues and obstacles, level of support provided to faculty, useful resources and best practices, and comparison of findings to the GODAN donor report. The webinar will be led by Anne Mims Adrian and Kara Newby of PUSH and the Hunger Solutions Institute at Auburn University, USA. They will discuss current status open data policies, practices, perceptions of benefits, challenges, and barriers of open data at these universities. This webinar is supported by GODAN Action and CTA. Apply by 5 November 2018 ! Free GODAN Action "Open Data Management Online Course in Agriculture, Nutrition and Land"